Last to last week (Wednesday, 11th of August, to be precise) I had the most harrowing experience of my life. The sky was overladen since morning but decided to unburden right at the time when we proceed homeward from work. Finally the torrential pour gave way to a mild drizzle. But it was good enough to congest the roads with stranded traffic. The city came to a stand still. I missed my chartered bus due to the untimely rain. 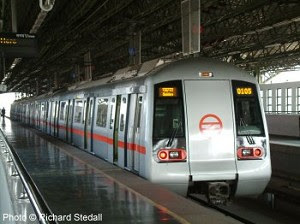 My colleague gave me a lift till Pulbangash (Old Delhi) Metro Station. Pulbangash is not a place to be visited by ladies unchaperoned after nightfall. But that was the only station which could be accessed enroute that too after patient maneuvering for almost two hours through bumper-bumper traffic. To my horror, the platform was pitch dark, Metro was not plying due to technical fault and above all there was no guard at the station to manage the restless crowd. Alternate transport was next to nil. Ultimately, out of desperation I had to call home. My family came all the way to pick me up from the station. The journey took them an hour or so by car. While exiting I made sure that my Metro Pass gets registered at the gate. It’s a penal offence if the Pass only reflects an entry without a corresponding exit. A DMRC personnel was having a furious debate with a drunken chap who demanded he be returned one of his chappal which he claimed to have lost in the over-crowded train. I requested the official to punch in my exit as the machine was not registering the same. He did and confirmed so. But next morning, as usual my Pass was not accepted by the machine at the entrance. On enquiry, I was told that the Pass did not reflect yesterday’s exit. I narrated the whole story of the previous night to the official at the counter but to no avail. As penalty, I had to pay the fare of the entire journey which I had not undertaken. It was a nominal sum but I decided to lodge a complaint with DMRC just to make them aware of the loopholes in the system and consequent harassment to the general public. I was pleasantly surprised when a voice promptly replied my call (there is no customer care e-mail service; one can only make a call to a toll free number readily available at every Station). In fact, I had expected the call to go unattended. Anyway, I related my experience. He was considerate, took my Metro Pass no, apologized for the inconvenience caused and informed politely that DMRC would get back to me by the next morning after making necessary investigations into the matter. A week has passed by since then and I am yet to receive any come-back from DMRC on the issue.……………….